Savvy Spending: Local Readers: Free admission to Michigan Science Center on Saturday 6/20! Local Readers: Free admission to Michigan Science Center on Saturday 6/20! Here's another FREE Local Deal! 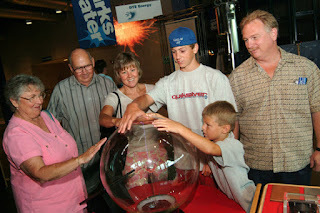 Saturday, June 20, the Michigan Science Center is offering FREE Admission! This is a fantastic museum (we've been there many times) and a huge discount! Show your appreciation for your favorite teacher and receive free general admission on June 20! Thanks to the Ford Motor Company Fund, MiSci general admission will be free for all visitors on June 20. As the school year ends, guests are invited to show their appreciation for their favorite teacher throughout the day. Enter a raffle to win a free MiSci field trip for next school year and receive a free MiSci gift, plus special take-home lesson plans. Draw a picture or make a card for your favorite teacher in Kids Town. Enjoy hands-on demonstrations featuring Apple Circuits in Centennial Lab. Experience the grand opening of Robot Lab, supported by Quicken Loans, in the ITC Gallery.